At a little before 4 a.m. on September 16th, in Gwinnet County, Georgia, three armed home invaders picked the wrong house. The video shows much of the action, but written accounts fill in some interesting details. 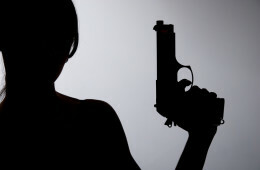 The Chinese immigrant woman, Chen Fengzu, had recently been given a gun by her husband. She had fired it at the range one time. A shop assistant was staying at the house that night, (in a separate bedroom). The shop assistant was rousted first. He shouted a warning, “No Money!” He was not armed. But Chen Fengzu was. She came out shooting. This is a good tip, a good way to alert others in the house while appearing to be compliant. It does not reveal the existence of another resident. There is much that can be criticized in Chen Fengzu’s tactics, if you wish to do so. She acted with admirable courage and delivered a fine performance for her limited training. She is serving as an inspiration for millions of Chinese around the world. Her example was played on the Chinese official government television, and has gone viral in China. Anyone considering the proposed ban on “Large Capacity Magazines” would do well to notice that Chen Fengzu shot her pistol empty, but did not seem to notice. It might have been a critical difference if there had been four intruders, or if they had not fled so quickly. A pistol with an 11-20 shot standard magazine would have given her more defensive flexibility.